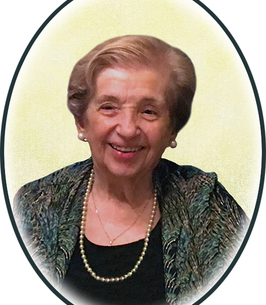 It is with great sadness that the family of Lilia Sgrignuoli (nee) Sorgini announces her passing on November 13th, 2018 in her 89th year. Lilia passed away peacefully, surrounded by her loving family. Predeceased by her beloved husband Giuseppe (1992). She leaves behind her daughters Silvana Melara (late Joseph), Linda Aromatario (Giuseppe) and son Michael (Mary). Proud grandmother of Lilia, Christina and Alicia. Great-grandmother of Victoria. Lilia loved to bake and cook delicious, rustic Italian meals for her family and friends. She will be missed by her brother Donato and sister-in-law Mary, along with many nieces, nephews and cousins in Toronto and Fossacesia. Everybody loved Lilia! Relatives and friends are welcomed at the Bernardo Funeral Home (2960 Dufferin St. south of Lawrence Ave. W) on Friday from 2 pm to 9 pm. Funeral mass at 10 a.m., on Saturday November 17th in St. Charles Borromeo Church (811 Lawrence Ave., W. at Dufferin St.). Burial in Prospect Cemetery. In lieu of flowers a donation may be made to St. Joseph’s Healthcentre ICU or a charity of your choice. To plant a tree in memory of Lilia Sgrignuoli, please visit our Heartfelt Sympathies Store. We encourage you to share any memorable photos or stories about Lilia. All tributes placed on and purchased through this memorial website will remain on in perpetuity for future generations. Lilia will always be remembered walking up paramount with her beloved pets. She truly was an animal lover. She was the master baker of our neighbourhood. She was a compassionate lady especially when our mother was sick, taking us in at lunch time from school to nourish us with a beautiful lunch. We will always hold her near to our hearts. Sending our deepest condolences for the loss of this wonderful woman. May she Rest In Peace. Anna and family. Rest in Peace Lilia, you will be missed. In loving memory of Lilia, rest in peace.